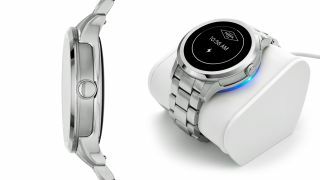 We confirmed Fossil was getting into Android Wear last month. Now here's the proof: the Fossil Q Founder is now on sale. Running the same class of Intel chip as the somewhat more expensive TAG Heuer Connected, the Q Founder is made of stainless steel and has an IP67 rating, meaning it can withstand water up to 1 metre deep. The spec is rounded out with Bluetooth LE but no Wi-Fi, 4GB of storage and a 400mAh battery giving a stated 24-hour life. Fossil fails to note the screen resolution, and with a 46mm case size that could point to less than pristine sharpness, not that we've ever seen an Android Wear timepiece that could be described as low-resolution as such, nor do we expect this one to look bad. The Q Founder is the first fruits of Fossil's Connected Accessories line, and takes a standard 22mm watch strap, meaning no proprietary shenanigans when it comes to customisation. The cost? That'll be $299 if you're in America or £279, which is about the equivalent of about $420, in the UK. Do you Americans have any idea how lucky you are? Aussie pricing is not declared yet but we'd expect about AU$580 on the basis of that. • Our current favourite smartwatches can be found here. On a macro level, this seems like good news to us. Bottom line: Fossil is better at making watches than tech brands are, while Google's stern benchmark requirements and no-messing policy when it comes to Android Wear means this should be functionally all-but identical to watches from the likes of Huawei, LG, Asus and the rest. The news follows hot on the heels of Fossil's acquisition of Misfit and, not surprisingly, Fossil is claiming fitness tracking as a key feature on the Q Founder. On a charmingly archaic final note, the full name of the piece is 'Fossil Q Founder Digital Stainless Steel Watch'. Lovely.